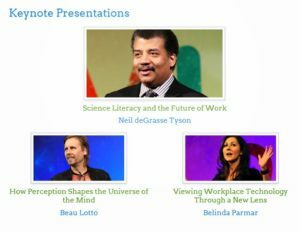 Neil deGrasse Tyson kicked off his keynote presentation at DevLearn by explaining that children are born scientists who have an inherent interest in discovering scientific principles. All kids are fascinated by a spilled cup and the way the liquid flows along the ground, more commonly known as fluid dynamics. He says that scientists are kids that never grew up, and that too many parents discipline the scientist out of kids in a trade-off for cleanliness. Let the kids conduct their scientific experiments like spilling milk, breaking eggs, and jumping in puddles. He goes onto say that we need to change our education system, because currently it rewards the students who are the best behaved ones, rather than the ones that are pushing the limits. DevLearn is one of ForgeFX’s favorite conferences and expositions when it comes to learning about new technologies and tools that are relevant to job training and eLearning, and to gain insight and inspiration from others who are working in the field.